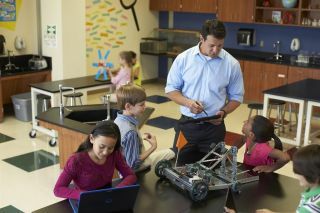 Dell announced the Latitude 13 Education Series laptop, Dell Mobile Computing Cart upgrade kit, and Dell Interactive Projector S520. These new additions join the recently introduced Dell Chromebook 11 and Dell Venue tablets. With powerful processors, the Latitude 13 Education Series features a 13.3-inch display and a full-size keyboard. The Dell Mobile Computing Cart – available managed or unmanaged – holds up to 30 netbooks, Ultrabooks, laptops and/or tablets of most brands up to 14-inches. The cart also features two external outlets to support devices on top, such as a printer, teacher laptop or document camera. It’s now available with an optional upgrade kit for snuggly docking laptops to Ethernet and power, which makes overnight IT updates a snap and eliminates the need to manually plug in cables. Also a new addition, the Dell Interactive Projector-S520, features multi-touch capabilities, Intel® Wireless Display (Intel® WiDi) + Miracast technology and advanced wireless functions for classrooms and conference rooms of nearly any size. The S520 combines features of interactive whiteboards and interactive LCD displays into one convenient solution. The whiteboard is no longer just for teachers; it lets students showcase their work, collaborate, too. The Latitude 13 Education Series starts at $539 USD. Non-touch models are available in red and blue. Touch and non-touch models are available in black. The Dell Interactive Projector - S520 starts at $4,129 USD. Both are available today. The managed Dell Mobile Computing Cart with the upgrade kit installed starts at $3,999 USD. The standalone upgrade kit, which is compatible with select previous generation managed and unmanaged models, begins at $799 USD. The new kit will be available globally in early April.